Home » Is School Boundary Redistricting in Your Future? Our family moved to Eden Prairie, MN during the middle of the 2011—12 school year. On an ice crystal-cold morning in January, I was pleasantly surprised to discover that a school bus would collect my boys at our corner. When we decided which house to purchase we had been under the impression that our family fell into the “walker” category because we lived only a few blocks from an elementary school. The pleasant feeling faded as the other parents at the bus stop abandoned their “Minnesota nice” roots and described the acrimonious year-long redistricting process that had sent our neighborhood kids to a school about 1 and a half miles away. Our realtor neglected to mention the redistricting controversy when we were house shopping in the fall. It turned out that we were not concerned about which Eden Prairie school our kids attended. They rode the bus to school and they received an excellent education. However, 7 years later I still hear parents becoming emotional when discussing the redistricting process and outcome. This redistricting story is an example of how difficult attendance zone boundary (AZB) changes can be, even in small and relatively tranquil places like suburban Minnesota. The Eden Prairie school district initiated the boundary change process to address operational inefficiencies, improve diversity within schools, and increase student achievement. Seemingly harmless goals such as “keep[ing] neighborhoods together and keep[ing] kids close to schools” can become controversial if neighborhood patterns perpetuate concentrated pockets of socioeconomic disadvantage or racial segregation . AZB changes have the potential of consuming extraordinary amounts of district administrators’ time and other resources. 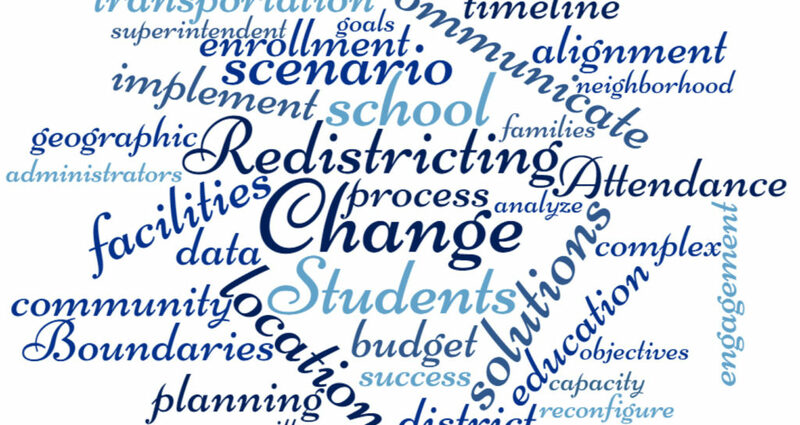 Researchers Annette Lareau, Elliot B. Weininger, and Amanda Cox, in a 2018 article  and a related New York Times Opinion piece  describe their study in which a school superintendent estimated that he spent 70–80% of his working time over several months just on a redistricting controversy. Similarly, in an article by Jeffrey Solochek, the school board members in Pasco County, FL say they have spent “countless hours” on a redistricting process that has involved one law suit already, with another one threatened . Redistricting can also pose a hazard to continued employment as many administrators in Eden Prairie discovered. A USA Today article detailed the heated emotions and controversy that “…upended the school board and prompted about two dozen administrators to flee the district, including Eden Prairie’s long-serving superintendent” . In spite of fleeing administration, an analysis done five years later concluded that “the Eden Prairie story may show that the path to progress can be challenging, but also that it is worthwhile” . More versions of changing AZB stories happen every year in districts all over the country. To help school administrators understand the AZB change process and how redistricting works in other districts, we’ve compiled a study of Common Practices in Changing School Attendance Zone Boundaries.